Creating a website from scratch on an iPad isn't for the faint hearted, especially if you are going to use HTML. There are, however, many times when you need to make an amendment, or insert a similar page on a website; this App enables you to do that with ease. The default screen is HTML coding down the left of the screen and the resultant output on the opposite side, in landscape mode. The editor contains very useful undo and redo commands, as well being able to download existing files from Dropbox or directly from a URL. This latter option is extremely useful if you need to make a change or copy/paste in an existing website. Your amended file can be saved to Dropbox, as well as being emailed. Crucially, your amendments can also be sent directly to your hosted site and your log-in details maintained in a 'Saved FTP Accounts' listing. There are icons for creating links, inserting pictures, creating style sheets, and (obviously) text. If you ever need to make a modest amendment to an existing webpage and only have your iPad, you would willingly part with many times the $2 that the App costs. Obviously this depends on how much web work you do. This App requires iOS 7.1 or later, as well as an iPad; the smaller screen of other iOS devices just wouldn't cut the mustard. The App works very well but has a little quirk in that the change of display from code/display to either code or display is effected through the 'Menu' option (you just need to remember this when you want to change it back). The App is not password protected; you need to be aware of this as you could have entered passwords that will allow anyone to access our websites and alter them. Great way to edit websites on the move. 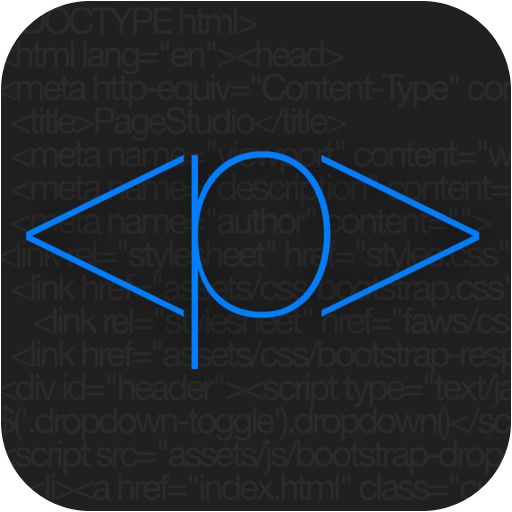 You can get PageStudio here and support for the App here. Web preview cache bug fixed. Saved files included in your document will not be old versions.